While we often hear a lot of talk about high and low intelligence quotient (IQ) scores, many people aren't quite sure what these designations really mean. An IQ score of 70 or below is considered a low score. 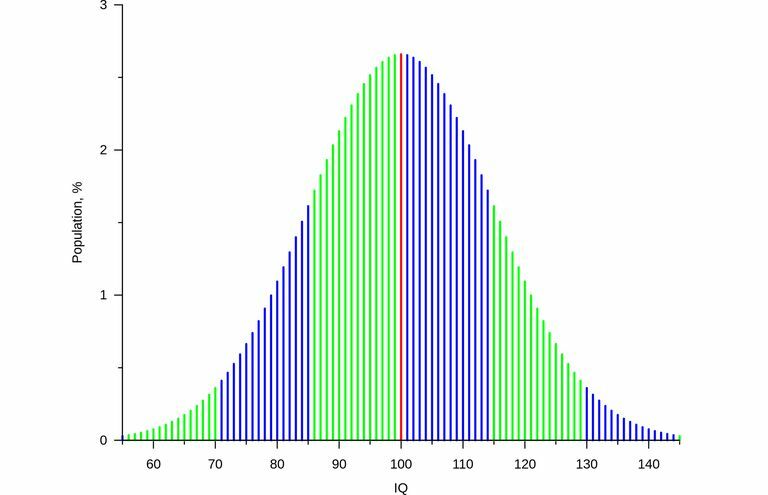 On most standardized tests of intelligence, the average score is set at 100. Anything over 140 is considered high or genius-level. Approximately 68 percent of all people score somewhere between 85 and 115, the range within 15 points of the average. So what does it mean to have a score 70 or below? In the past, an IQ score below 70 was considered a benchmark for mental retardation, an intellectual disability characterized by significant cognitive impairments. Today, however, IQ scores alone are not used to diagnose intellectual disability. Instead, the criteria for a diagnosis includes an IQ of 70 or below, evidence that these cognitive limitations existed before the age of 18, serious limitations in areas such as learning and reasoning, and severe limitations in adaptive areas such as communication and self-help skills. Intellectual disability is the most common type of developmental disorder and affects approximately 0.05 percent to 1.55 percent of all people. Intelligence quotient is a score derived from a standardized test designed to measure intelligence. IQ tests formally emerged in the early 1900s with the introduction of the Binet-Simon test, which was later revised and became known as the Stanford-Binet. Binet developed his initial test to help the French government identify students with cognitive impairments who needed additional assistance in school. IQ tests have proven to be very popular both within psychology and with the general public, but there remains a great deal of controversy about exactly what IQ tests measure and how accurate they are. Older conceptions of low IQ tended to focus purely on cognitive abilities, but more modern approaches also stress how well an individual functions mentally and in areas of everyday life. Individuals with an IQ score below 70 may be diagnosed with an intellectual disability if they also experience deficits in two or more areas that influence daily living. Examples of such adaptive behaviors include the ability to take care of oneself and the ability to communicate and interact with other people. The term "mental retardation" was previously used to describe individuals diagnosed with low IQ, but this term is now viewed as an insult and has been largely replaced by the term "intellectual developmental disorder" or "intellectual disability." The previous term is still used in some settings, including some diagnostic codes and for insurance purposes. American Psychiatric Association (APA). What Is Intellectual Disability? Updated July 2017. American Speech-Language-Hearing Association. Intellectual Disability. 2017. McKenzie K, Milton M, Smith G, Ouellette-Kuntz H. Systematic Review of the Prevalence and Incidence of Intellectual Disabilities: Current Trends and Issues. Current Developmental Disorders Reports. June 2016;3(2):104-115. doi:10.1007/s40474-016-0085-7. How Important Is Intelligence for a Mental Disorder Diagnosis? Does a High IQ Lead to Greater Success? IQ or EQ: Which One Is More Important?